After a hiatus to host CSMB2017, the OISB biannual retreat is back on and promises to be bigger than ever. With over 35 affiliated labs, come on out and learn about the ground breaking systems biology research that is taking place across Ottawa. Stay tuned for the final schedule of events. 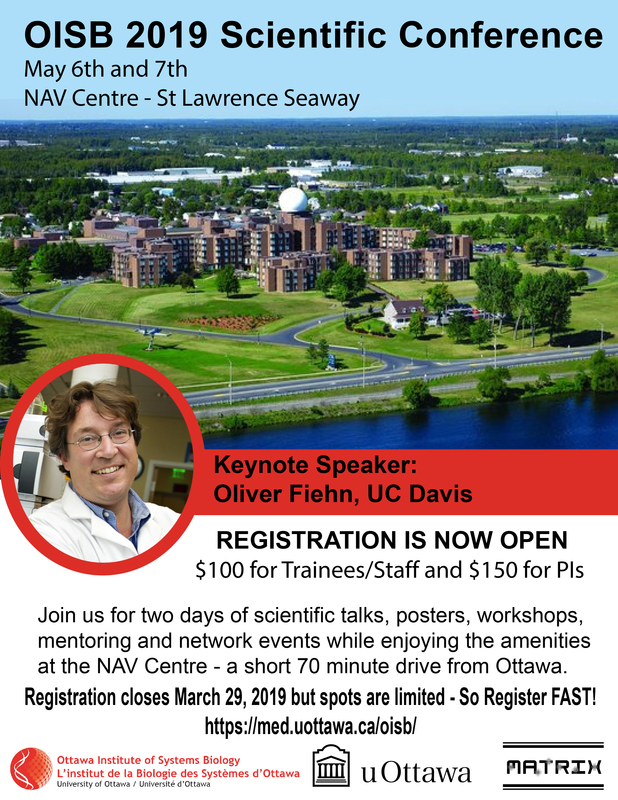 OISB2019 will be taking place at the NAV Centre – a short 60 to 70 minute drive from Ottawa. What is the NAV Centre? Originally built as Canada’s training centre for air traffic controllers, and though you may still see pilots and military on site for courses, it is now a conference centre open to the public. This 70 acre resort-like facility is located on the St. Lawrence Seaway on the outskirts of Cornwall and is home to variety of amenities including beach volleyball, tennis courts, baseball diamonds, basketball courts, swimming pool, fitness centre and direct access to over 40km of trails. Registration is just $100 for trainees/staff and $150 for PIs. This includes one night accommodation, and two lunches, one dinner and one breakfast in Propeller’s Restaurant. Deadline for Registration and Abstract Submission: March 29th, 2019. But spots are limited. So do not be disappointed, register soon. Hope you are able to join us for this amazing event.